Hey, want to know the future? Testing in Production with real users in real data centres will be a necessity for any high performing large scale software service. 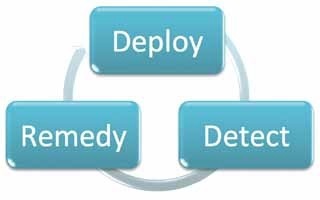 Testers will leverage the Cloud to achieve unprecedented effectiveness and productivity. Software development organisations will dramatically change the way they test software and how they organise to assure software quality. This will result in dramatic changes to the testing profession. Is this really the future? Well, maybe. Any attempt to predict the future will almost certainly be wrong. What we can do is look at trends in current changes – whether nascent or well on their way to being established practice – and make some educated guesses. Here we will cover Testing in Production. The other predictions will be explored in subsequent editions of Testing Planet. The provider also has visibility into the data centre running the service, granting access to system data, diagnostics, and even user data subject to privacy policies. It is these very features of the service that enables us to TiP. As Figure 1 shows, if software engineers can monitor production then they can detect problems before or contemporaneously to when the first user effects manifest. They can then create and test a remedy to the problem, then deploy it before significant impact from the problem occurs. When we TiP, we are deploying the new and “dangerous” system under test (SUT) to production. The cycle in Figure 1 helps mitigate the risk of this approach by limiting the time users are potentially exposed to problems found in the system under test. But why TiP? Because our current approach of Big Up-Front Testing (BUFT) in a test lab can only be an attempt to approximate the true complexities of your operating environment. One of our skills as testers is to anticipate the edge cases and understand the environments, but in the big wide world, users do things even we cannot anticipate and data centres are hugely complex systems unto themselves with interactions between servers, networks, power supplies and cooling systems. The virtuous cycle of Figure 1limits user impact by enabling fast response to problems. Up-Front Testing (UFT)is still important – just not “Big” Up-Front Testing (BUFT). Up-front test the right amount – but no more. While there are plenty of scenarios we can test well in a lab, we should not enter the realm of diminishing returns by trying to simulate all of production in the lab. (Figure 2). For some TiP methodologies, we can reduce risk by reducing the exposure of the new code under test. This technique is called “Exposure Control” and limits risk by limiting the user base potentially impacted by the new code. As an emerging trend, TiP is still new and the nomenclature and taxonomy are far from finalized. Butin working with teams at Microsoft, as well as reviewing the publically available literature on practices at other companies, 11 TiP methodologies have been identified (Table 1). Ramped Deployment Launching new software by first exposing it to subset of users then steadily increasing user exposure.Purpose is to deploy, may include assessment. Users may be hand-picked or aware they are testing a new system. Controlled Test Flight Parallel deployment of new code and old with random unbiased assignment of unaware users to each. Purpose is to assess quality of new code, then may deploy. May be part of ramped deployment. Experimentation for Design Parallel deployment of new user experience with old one. Former is usually well tested prior to experiment. Random unbiased assignment of unaware users to each. Purpose is to assess business impact of new experience. Dogfood/Beta User-aware participation in using new code. Often by invitation. Feedback may include telemetry, but is often manual/asynchronous. Synthetic Test in Production Functional test cases using synthetic data and usually at API level, executing against in-production systems. “Write once, test anywhere” is preferred: same test can run in test environment and production. Synthetic tests in production may make use of production monitors/diagnostics to assess pass/fail. Outside-in load /performance testing Synthetic load injected at (or close to) same point of origin as user load from distributed sources. End to End performance, which will include one or more cycles from user to SUT and back to the user again, is measured. User Scenario Execution End-to-end user scenarios executed against live production system from (or close to) same point of origin as user-originated scenarios. Results then assessed for pass/fail. May also include manual testing. Data Mining Test cases search through real user data looking for specific scenarios. Those that fail their specified oracle are filed as bugs (sometimes in real-time). Destructive Testing Injecting faults into production systems (services, servers, and network) to validate service continuity in the event of a real fault. Production Validation Monitors in production check continuously (or on deployment) for file compatibility, connection health, certificate installation and validity, content freshness, etc. To bring these methodologies to life, let’s delve into some of them with examples. Testing a release internally like this can also be considered part of Dogfood TiP methodology. Controlled Test Flight can also be enabled via a TiP technique called Shadowing where new code is exposed to users, but users are not exposed to code. An example of this approach was illustrated when Google first tested Google Talk. The presence status indicator presented a challenge for testing as the expected scale was billions of packets per day. Without seeing it or knowing it, users of Orkut (a Google product) triggered presence status changes in back-end servers where engineers could assess the health and quality of that system. This approach also utilized the TiP technique Exposure Control, as initially, only 1% of Orkut page views triggered the presence status changes, which was then slowly ramped up. As described, Destructive Testing, which is the killing of services and servers running your production software, might sound like a recipe for disaster. But the random and unexpected occurrence of such faults is a certainty in any service of substantial scale.In one year, Googleexpects to see 20 rack failures, three router failures and 1000s of server failures. So if these failures are sure to occur, it is the tester’s duty to assure the service can handle them when they do. A good example of such testing is Netflix’s Simian Army. It started with their “Chaos Monkey”, a script deployed to randomly kill instances and services within theirproduction architecture. “The name comes from the idea of unleashing a wild monkey with a weapon in your data center (or cloud region) to randomly shoot down instances and chew through cables.” Then they took the concept further with other jobs with other destructive goals. Latency Monkey induces artificial delays,Conformity Monkey finds instances that don’t adhere to bestpractices and shuts them down, Janitor Monkey searches for unused resources and disposes of them. Run tests continuously, not just at deployment. Use parallelization to run thousands of tests per run. Data is collected and displayed in scorecards, providing continuous evaluation of quality and service availability. Production has been traditionally off-limits to testers. The dangers of disruption to actual users should not be under-estimated. But by using sound TiP methodologies, we can limit risk and reap the benefits of testing in production to improve quality, which is ultimately the best way to benefit our customers. Seth Eliot is Senior Knowledge Engineer for Microsoft Test Excellence focusing on driving best practices for services and cloud development and testing across the company. He previously was Senior Test Manager, most recently for the team solving exabyte storage and data processing challenges for Bing, and before that enabling developers to innovate by testing new ideas quickly with users “in production” with the Microsoft Experimentation Platform. Testing in Production (TiP), software processes, cloud computing, and other topics are ruminated upon at Seth’s blog at http://bit.ly/seth_qa and on Twitter (@setheliot). Prior to Microsoft, Seth applied his experience at delivering high quality software services at Amazon.com where he led the Digital QA team to release Amazon MP3 download, Amazon Instant Video Streaming, and Kindle Services.